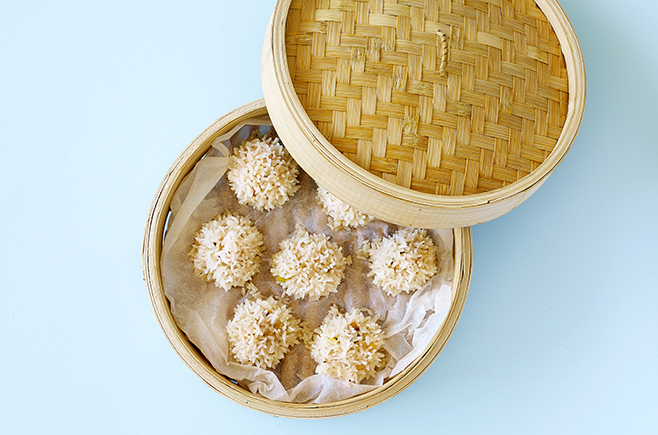 These bite-sized chicken and rice balls make a delicious snack or party canape. They’re steamed, instead of fried, so they’re healthy too. Chicken and Rice Balls recipes by Sandra Basic, photography by Brandee Meier. Combine chicken, shallots, mushrooms, oyster sauce, chilli paste, garlic, ginger and salt. Mix well. Roll into walnut sized balls then roll in rice. Place in baking paper lined steamer baskets leaving room in between balls. Steam over boiling water for about 30 minutes or until balls and rice are cooked. Serve with soy sauce, if desired. This recipe for Chicken and Rice Balls first appeared in Issue 12 of Australian Gluten-Free Life magazine. Pick up a copy today for more delicious gluten-free Yum Cha inspired dishes.